Nationally house prices are unchanged in the past month and up 2.9% on average in the past year. 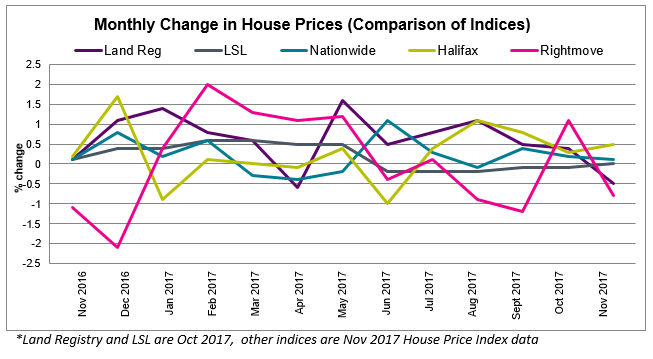 Halifax (0.5%) and Nationwide (0.1%) report a rise in house price growth over the past month. 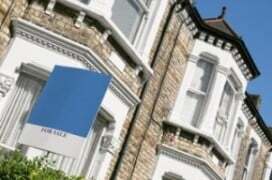 LSL (0%) say monthly house prices are stable. Land Registry (-0.5%) and Rightmove (-0.8%) report a fall in house prices. Land Registry and LSL refers to October house price data. Nationwide, Halifax, and Rightmove refer to November house price data. 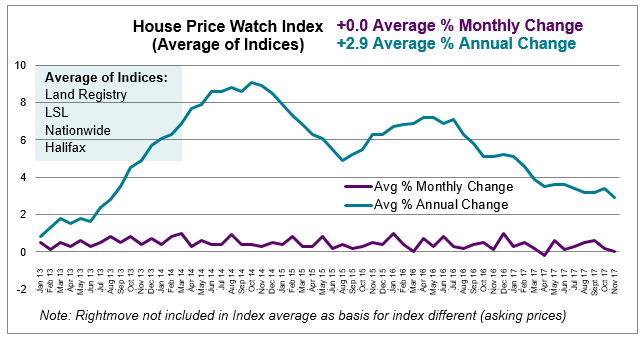 Across the major indices, house prices are unchanged in the past month and up 2.9% on average in the past year (Rightmove is excluded from the average). The trend of slowing house prices in 2017 continues. UK home sales are up 1.7% between September and October 2017. Transactions are 9.2% higher than October 2017. However, mortgage approvals for house purchases, which are a leading indicator of completed house sales, are down 2.3% between September and October. 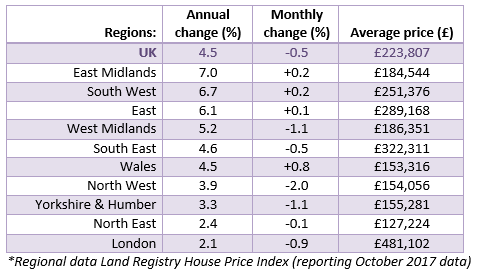 In the past month, house prices fell in many parts of the country including the North West (-2.0%), Yorkshire & Humber (-1.1%), London (-0.9%) and the North East (-0.1%). Areas experiencing the highest annual house price growth include the East Midlands (7.0%), South West (6.7%) and the East of England (6.1%). Annual house price growth is slowest in London (2.1%) and the North East (2.4%).